Melbourne Lifestyle Blog: Best vegetarian dinner, easy and delicious. Best vegetarian dinner, easy and delicious. Boyfriends’ mums have a habit of making zucchini slice. They hear you are vegetarian and for your first meal at the family home, the Women’s Weekly slice without the bacon comes out. It would be a lovely gesture, except that I don’t like zucchini. Yes, when it comes to mothers and zucchini slice, none of the relationships lasted. But at work the other day, a lovely lady in my office was talking about this fabulous vegetable recipe. Impressed by her forward planning and lack of old school 90’s cook books, I was happy to find her recipe in my hands the next day. This dish is absolutely delicious. The ingredients list looks daunting but this is extremely easy to make, doesn’t require an oven and is somewhat healthy (depending on your definition). Upon my acupuncturist’s advice I used kidney beans but the original recipe asks for chickpeas. If using dried chickpeas, make sure you soak them in cold water from the night before. I tend to go with my gut instinct when it comes to cooking, so of course I am too disorganised to soak the beans or chickpeas the night before. Luckily red kidney beans cook reasonably quickly so if I have a spare of the moment decision to cook, this can be ready within 90 minutes. Place the dried kidney beans in a medium saucepan with lots of water and boil until soft (usually about an hour). In the meantime, prepare the sweet potato. Place the honey, water, sweet potato and butter into a large saucepan. Bring to the boil and then simmer until the sweet potato is cooked and the water evaporates so that the vegetable is in a thick sauce of deliciously smelling honey and butter. While the beans and potatoes are on the stove, you can prepare the tomato sauce. Heat the oil in a small pan and when hot add the onion, cumin and coriander seeds. Fry the onions until soft. Add the tomato paste and cook for a minute before adding the tinned tomatoes and sugar. Wait until the sweet potato and beans are cooked, and then add the spinach to the tomato sauce. Put the beans with the sauce and cook for another few minutes. Use this mix to line a large serving dish. 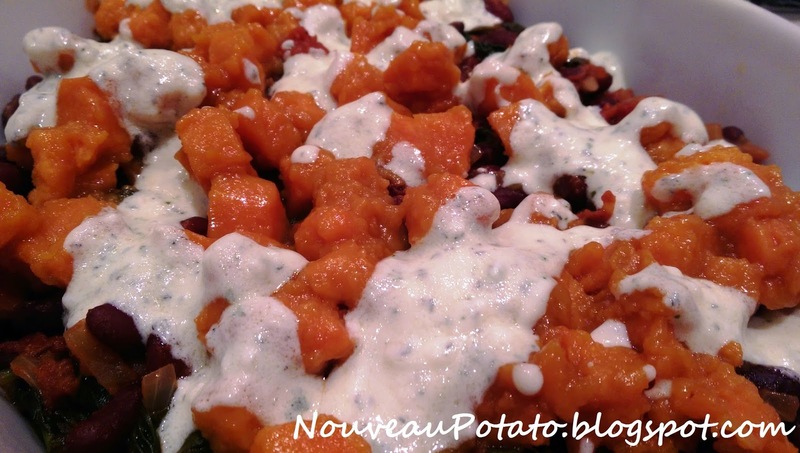 Place the sweet potato pieces over the top. To make the yoghurt sauce, add all the ingredients together and stir. The original recipe asks for the juice and grated zest of 1 lemon, but I find the kaffir lime tasty, and more readily available from our kaffir lime tree. Spoon the sauce over the top. I made this for my uncle’s 50th birthday and he had three helpings. If my new boyfriends’ mums had served me this, I would be married by now. Let me know what you think.